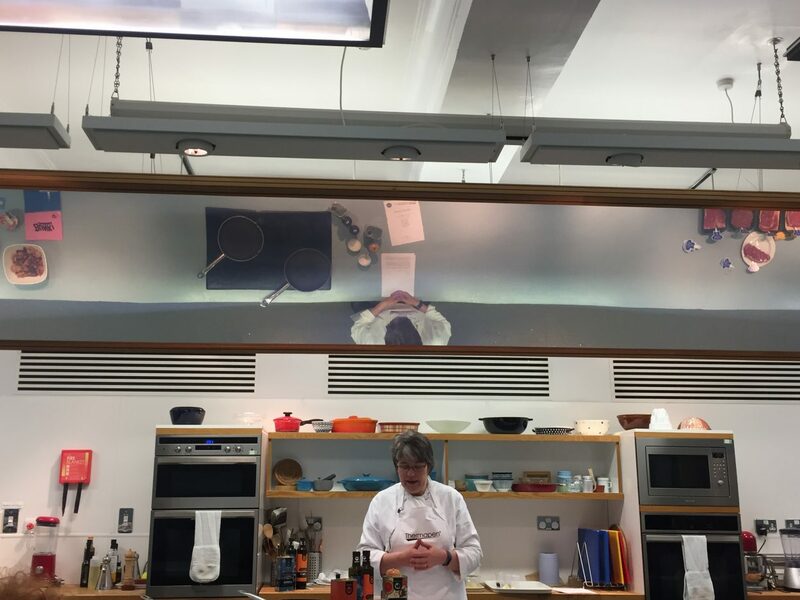 This month we were invited along to Edinburgh New Town Cookery School to take part in their Thermapen “Cook the Perfect Steak” workshop and enjoyed an evening of cooking and eating the very best Scottish Beef. 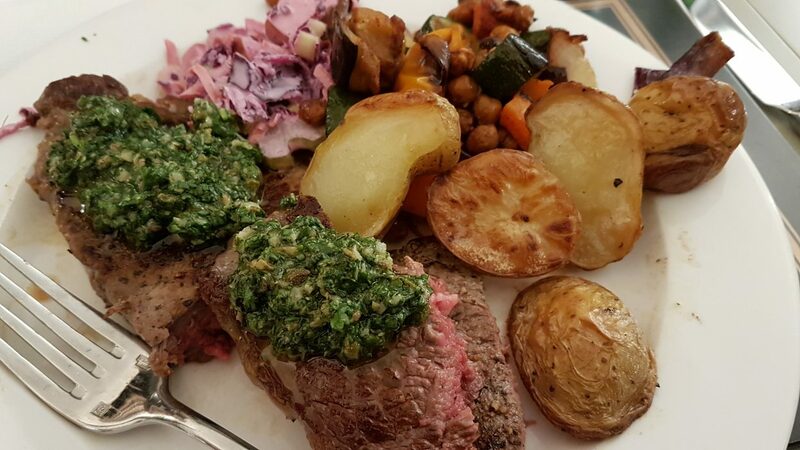 It seems that steak is the most commonly cooked dish on Valentine’s day so if you’re getting your pinnie out on the14th, we have some top tips for making sure you get your steak absolutely perfect. Paul Boyle, president of Federation of Meat traders kept us right about how to choose the best beef. A butcher is your best friend when it comes to choosing the perfect cut. They know exactly where the beef has come from, the age of the beast, how long it’s been matured for and will also make sure you get the right cut for your personal preferences. Some folks are put off going to a butchers shop as they are worried about cost and find it easier and simpler to select a pre-priced steak from the supermarket chiller. Butchers are keen to help make sure you get the best meat for your budget so tell them how much you want to spend and let them guide you. You will really notice the difference in quality and we’ve found that the prices are usually quite comparable too. With so many different cuts available and with butchers maturing the beef for different timescales it can become quite confusing to know what’s best. I used to think that the longer the beef was matured the tastier and better the steak would be. Interestingly, it seems that 24 days is the perfect maturity time to ensure the flavours fully develop without adversely affecting the taste. Butchers always mature the meat on the bone to give their steaks even more flavour so another great reason to choose your local butcher. So which type of cut to choose? Personal preference (and sometimes budget) will dictate the type of steak to select. Here’s a brief reminder about the main types of steak. Sirloin Steak – Make sure your steak has a good chunk of fat around the side and is marbled throughout with fat. This will give you the best flavours as the fat disperses on cooking and keeps the steak moist. 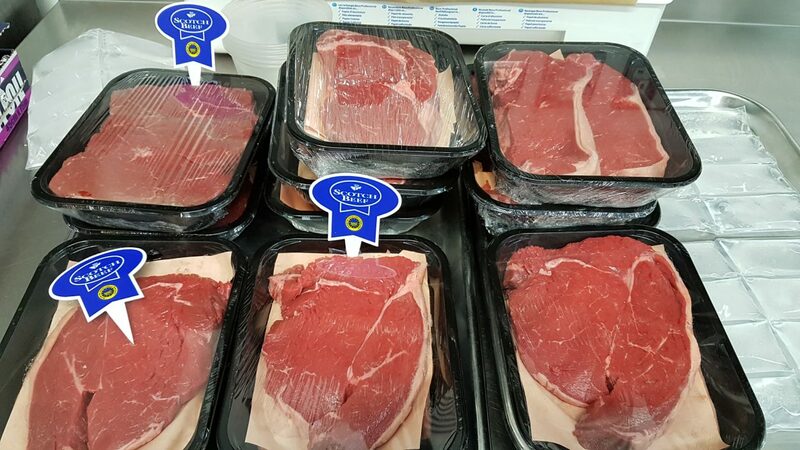 Rump Steak – A slightly cheaper cut but an excellent choice for frying or griddling. Rib Eye – This steak has the most flavour due to the marbled nature of the beef and is often larger than the other cuts – the butcher’s favourite. Fillet Steak – The best steak to have with sauce. The steak is never tough, always tender and develops a flavour like no other. It’s up to your personal preference whether to marinate your steak before cooking or not. Rump Steak being a slightly chewier cut benefits more from a bit of pre-cooking tender love and care. If you do decide to marinate the steak just use some olive oil, garlic, oregano and a splash of red wine and leave it for a couple of hours before cooking. It’s also always good practice to take the steaks out of the fridge about one hour before cooking to let them come to room temperature. (1) Heat the griddle or frying pan over a very high heat, until smoking hot. (3) Don’t griddle more than two steaks at a time and keep them well apart in the pan. If you try to cook more than two steaks at once the temperature of the pan will drop, and the liquid in the pan will increase. You will end up stewing the steak, rather than frying it. (4) Don’t turn the steaks until sear marks are achieved. Once seared turn the steaks over and cook the other side. (5) Take the pan off the heat. Using a Thermapen, test the temperature of the steak by inserting the probe into the thickest point. and for those who like it well-done (don’t tell the chef!) aim for 71 degrees centigrade. (6) Wrap the steak in foil and leave to rest for a third of the cooking time before serving. This will allow all the juices that have drawn to the surface to relax back into the meat. (7) Use any extra juices in the foil wrap to add to the flavour of any sauces you are making. We have been using a Thermapen for years so were already sold on the fact that every kitchen should have a high-quality food thermometer to make sure that your meats are cooked to perfection. The superfast Thermapen just needs to be inserted into the thickest part of the meat, and in three seconds you will have an accurate internal temperature. It completely takes away any guesswork making sure that your steak is perfect every time. 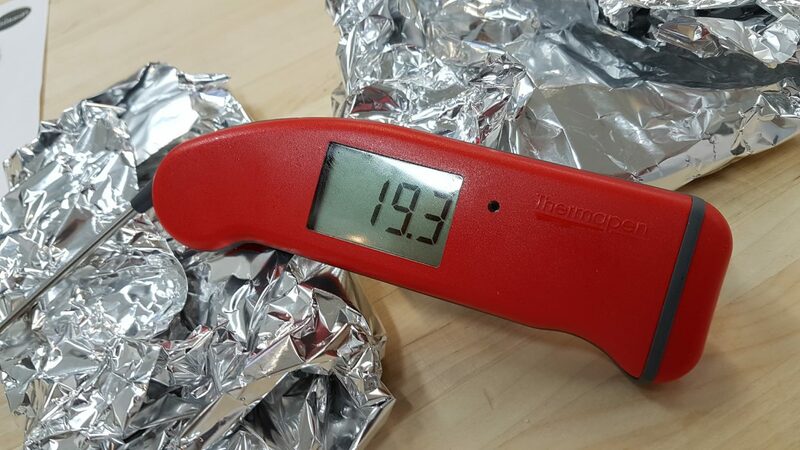 We use our Thermopen in the kitchen most days – checking the temperature of meats and when reheating things in the microwave. Thermapens are also great for making jam, baking, sugarcraft and especially for when you get the bbq out. 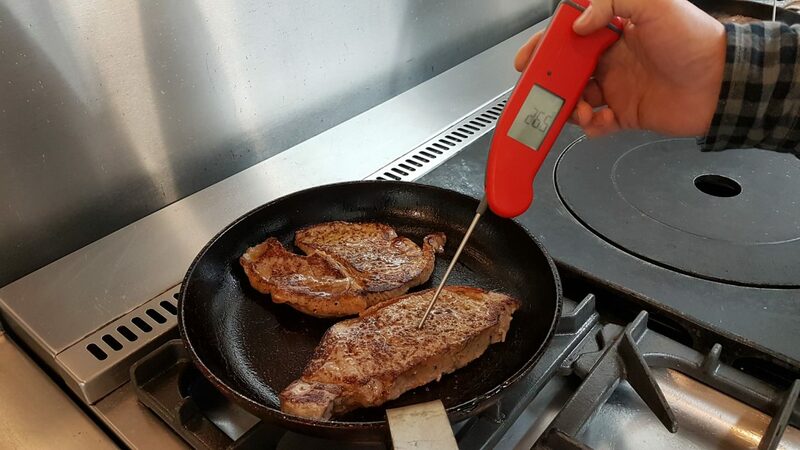 The Thermapen retails at around £50 but just think how many expensive joints of meat and steaks will no longer be overcooked – well worth the money! Your dinner guests will also thank you for not giving them food poisoning! What to serve your steak with? We always serve our steaks with roasted cubed potatoes with rosemary and salt and pepper, a few mushrooms and onions and sometimes add a sauce. 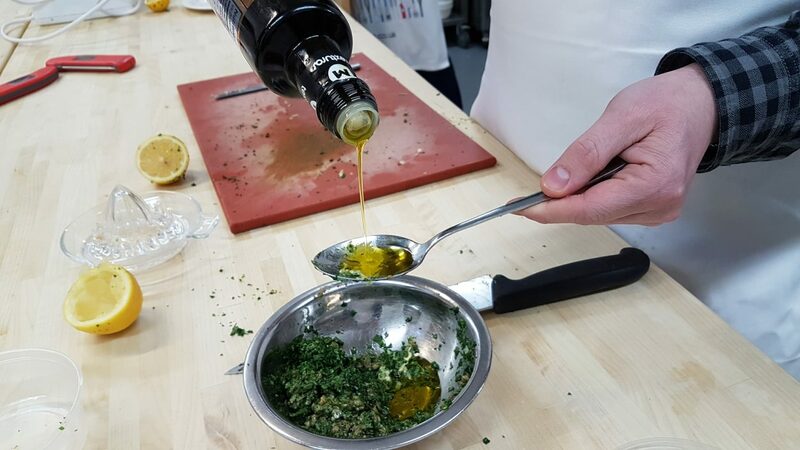 When we cooked our steak at The Edinburgh New Town Cookery School, we made a salsa verde to add to the top of the steak and it was delicious. Chop the anchovies and capers finely. Add the garlic, lemon juice, mustard, and herbs. Gradually add the olive oil, taste and season as necessary. After the cooking was done, it was time to sit down and enjoy our steaks. 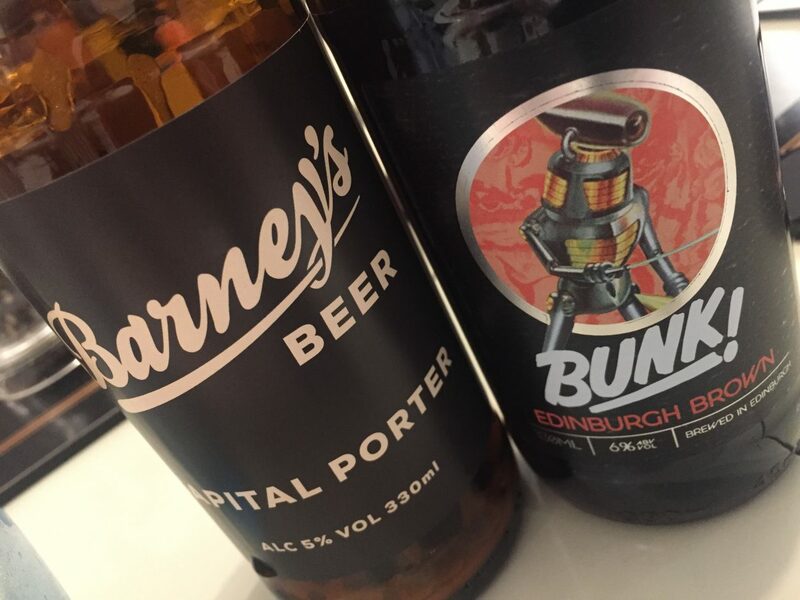 We would usually have a bottle of red wine with ours but Barney’s Beer and Edinburgh Beer Factory were on hand to help us with pairing beers to steaks. Why not complete your Valentine’s feast with either Barney’s Red Rye or Capital Porter for a rich, sweet, whisky like warming drink to compliment the richness of the meat or Edinburgh Beer Factory’s Polozzi Lager – perfectly chilled to provide a clean palette cleansing mouthful between each bite of your delicious steak. Their Bunk Edinburgh Brown, is also the perfect replacement if red wine is your usual steak tipple. 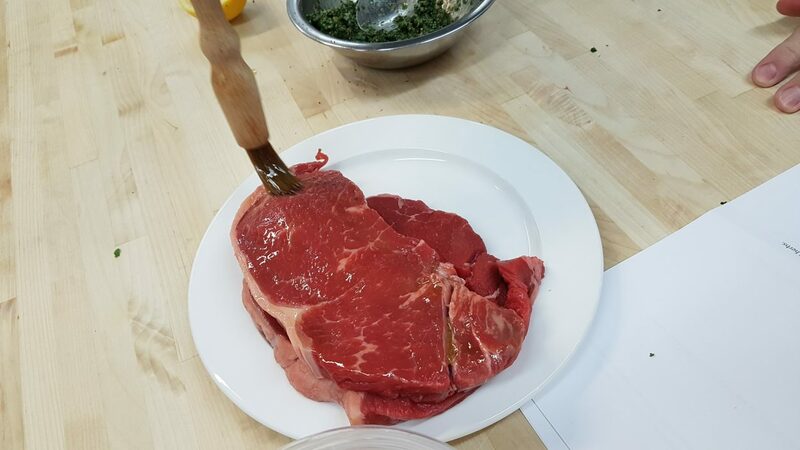 Steaks aren’t just for Valentine’s Day, so whenever and wherever you cook your next one we hope that the instructions from Edinburgh New Town Cookery School above help make it perfect for you. Feel free to share your steak and foodie pics with us on social media by tagging @boyseatscotland. If you haven’t joined our Facebook group, you’re invited! Pop over to facebook and request to join our group. It’s the perfect place for all our followers to share their foodie and travel recommendations of great places to Eat, Drink, Stay and Play in Scotland. You can also join our update service to make sure that you don’t miss any reviews or news in the future. Don’t worry we don’t email you every day – just when there’s an update. Click here to join us. NEWS: Valentine's Day - Why not take your Valentine Axe Throwing!